Peyto Lake is located in a convergence of valleys surrounded by magestic mountains and rich forests. The lake system is fed from the Peyto Glacier to the left of the view point and this gives the lake a magnificent blue/teal color in the summer months due to the mineral content. 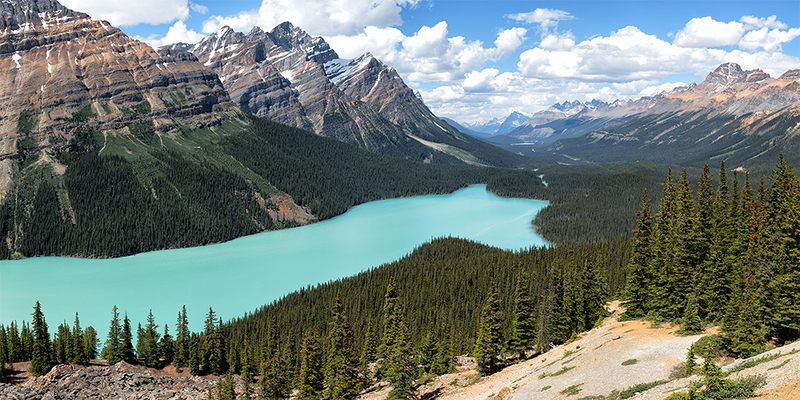 Named after Bill Peyto (a trapper), Peyto Lake gets its incredible color from glacial "rock flour". Rock flour consists of tiny particles that are formed when glaciers grind over rocky surfaces. These tiny fragments of rock are nearly the consistency of baking flour they are suspended in the water. This makes the water appear milky or cloudy. In the summer when it rains, or the glaciers and snow melts a bit, the milky water is deposited into the lakes and the suspended minerals reflect the sunlight in this really spectacular fashion. This majestic scene was captured in Banff National Park, Alberta Canada. This image is made up of 24 separate images, equating to about 345 megapixels for the full photo.